The Hunger Games meets The X-Men in an exciting post-apocalyptic debut. Two years after London is struck by a devastating terrorist attack, it is cut off from the world, protected by a military force known as Choppers. The rest of Britain believe that the city is now a toxic, uninhabited wasteland. But Jack and his friends, some of whom lost family on what has become known as Doomsday, know that the reality is very different. At great risk, they have been gathering evidence about what is really happening in London, and it is incredible. Because the handful of Londons survivors are changing. Developing strange, fantastic powers. Evolving. The first book in Tim Lebbon's Toxic City series is no doubt an eye-opener! His style and the simple genius of the story's plot will readily hook readers. 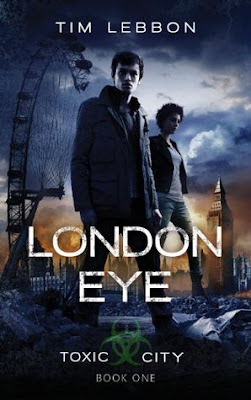 London Eye is so much more than the telling of how Jack and his friends survive in a drastically changed city. Lebbon quickly instills mystery, terror, and just a smidgen of hope that will cause readers to eagerly read the story through. London is the victim of a terrorist attack that caused the city to shut down and close off to anyone already outside. Most of the people died instantly, but the ones who survived awakened changed. Jack's mother is one of those evolving survivors, so when he and his little sister learn that she's still alive they find their way inside the supposedly toxic city with their friends: Lucy-Anne, Sparky, and Jenna. Jack and Lucy-Anne are portrayed as the central characters as the story flits between their third person perspectives. Everyone in the group has a dark background, a sad story to tell because of the damage done in London, but Jack and Lucy-Anne somehow have greater ties to the city. Jack is the level-headed type and Lucy-Anne is more impulsive, angry, and just a touch crazy, so it's interesting to see their different takes on what's happening to them. The light connection between them was short-lived, but added a little fuel to the group's dynamic. The group of friends steal into the city hoping to find the truth about what's really going on and answers to the fate of their lost family members. What they find is a desolate land 'protected' by Choppers and inhabited by many strange, yet powerful, characters. Choppers roam the streets looking for survivors to brutally experiment on, while the Irregulars and the Superiors hide or fight back. The way Lebbon relates London's destruction and aftermath is chilling, but so believable. It's not even hard to imagine when the survivors demonstrate their terrifying or useful new powers. 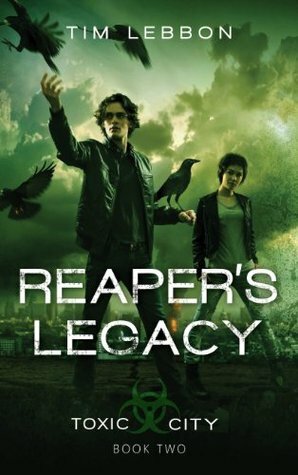 Lebbon's writing is subtle in it's intensity, and will leave you feeling awed and excited for the sequel, Reaper's Legacy. Order Toxic City, Book 2: REAPER'S LEGACY!